Like all content marketers, you want readers to get the most out of your content. But creating and distributing high-quality content across the increasing number of channels you’re expected to manage takes a lot of time and resources. Reusing content assets that have yielded good results is a powerful way to expand your content library and to promote the same content across different media channels and in different content formats. After all, what one person would enjoy as a stunning infographic, another would prefer as an expert advice e-book. This list of practical tools can help you give your existing content a new life. I love using Airtable to create an organized content database. You can use the tool, which has been described as a spreadsheet on steroids, to track brainstormed content ideas and plans for turning large assets into smaller pieces of content. The tool is flexible enough to handle the entire content reuse process. 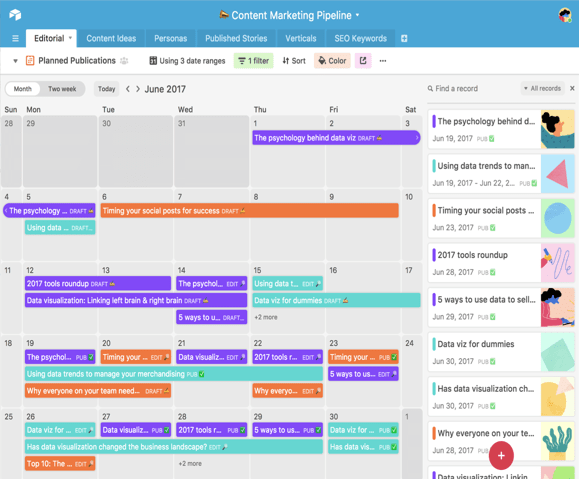 Use it to manage lists of keywords to help you optimize content for search engines, build a content calendar to keep track of deadlines and assignments, and measure the metrics and audience feedback for your repurposed posts. 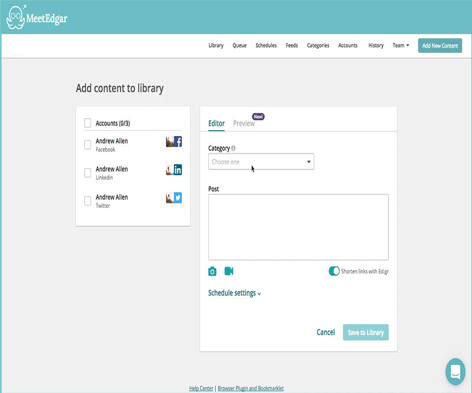 To schedule, manage, and republish your social media content, try MeetEdgar. This social media scheduling tool lets you create a “library” of social media posts that it automatically reposts for you over time. You fill the library with text, images, links, and graphics, group them by category, and indicate the platforms you want to share them on. MeetEdgar publishes the scheduled posts in each category; when the content runs out, the tool starts reposting it automatically. You can check when a piece is scheduled to post by looking at the queue. MeetEdgar lets you customize, reschedule, and adjust your posts as often as you want. 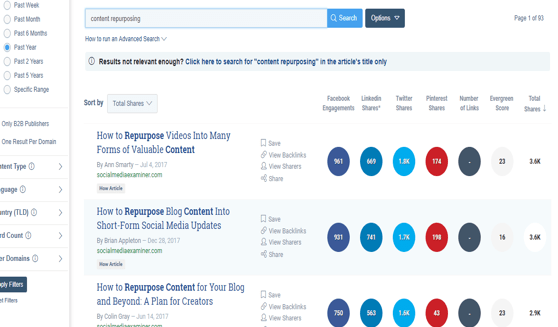 BuzzSumo is one of my favorite tools for monitoring content success and for getting a clear picture of what kind of content gets shared the most on social media. 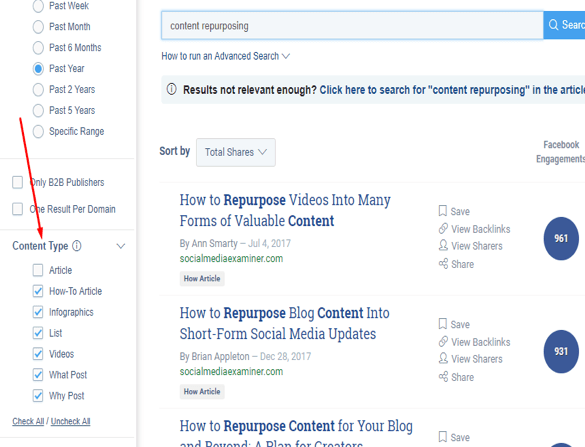 Most-shared and most popular content pieces make good candidates for repurposing.
.@BuzzSumo is one of my favorite tools for monitoring content success, says @irinaweber048. #tools Click To TweetBuzzSumo helps you also discover and filter results by content type (infographics, giveaways, interviews, videos, and guest posts) so you can see what’s been published about a given topic as you plan your content update. When you want to add new points of view to an existing article, BuzzSumo can help you find influencers and experts on your topic. Another way to decide which content makes sense to repurpose is to look at your search rankings and the search terms that drive the most traffic to your site. You can use SE Ranking (full disclosure, I work for the company) to track your ranking history and identify your most popular search terms. Use it to see which content achieved your goals in a certain period of time. You can also use it to monitor the performance of your posts and those of your competitors on the major social networks. 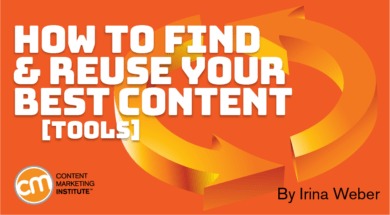 These insights help you fine-tune your content reuse plans. Livestreaming videos are one of the fastest growing and most-shared content types, in part because they let you engage with live audiences directly. If you’re going to spend the time to hang out with your audience, why not repurpose the content across platforms for broader reach? Repurpose is a great live video broadcaster and podcaster that lets me easily push all my Facebook Live videos to YouTube, make an audio file on SoundCloud, deliver a file to Dropbox, and so on. All it takes is to connect your accounts to the Repurpose tool. Use the tool to push live or prerecorded videos from your business page and personal pages to any of the platforms I mentioned. The best thing about Repurpose is that it simplifies your video and audio repurposing workflows, so you can extend your content’s reach with minimal effort. Google Analytics shows you how users interact with your content, including total page views over time, overall social engagement, and time spent on the site. Use these parameters to help you decide which content is best suited for repurposing. Google Search Console helps you see which pages attract the most links. Keep in mind that some content might attract links even if it doesn’t generate much traffic. 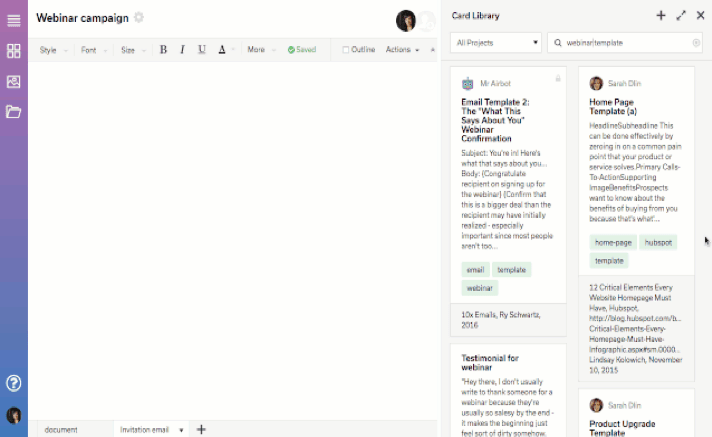 Writing platform Airstory lets you keep drafts, notes, and related content together as you work on a repurposing project. Use this drag-and-drop document builder to gather pieces of content you want to repurpose and collaborate with other content creators working on the same piece. The flexible tool lets you set up projects with deadlines, establish word-count goals, and upload templates. Repurposing content is a smart marketing strategy that can help you improve your search engine rankings, get more traffic to your site, and offer valuable information in different formats. But even if repurposing saves time compared to creating a new piece from scratch, getting the best results still requires careful planning and execution. I hope the tools I’ve shared can help you to bring fresh life to your valuable content.